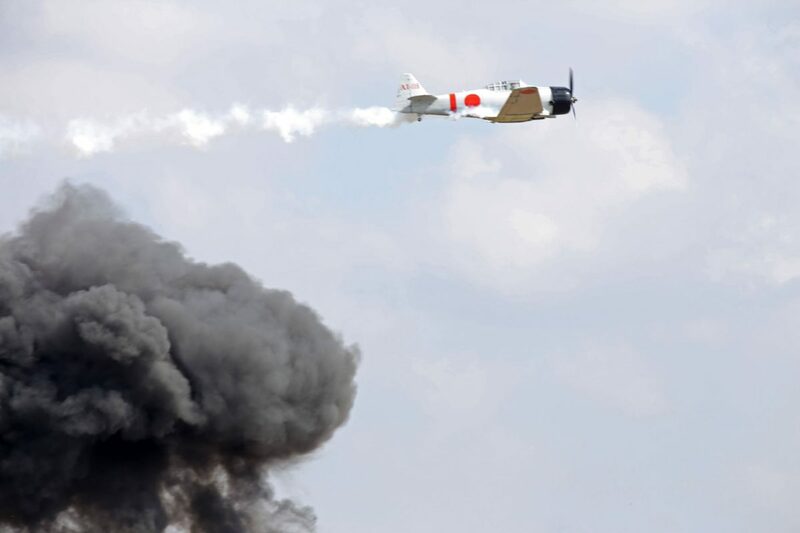 A World War II Japanese aircraft performs Saturday during the annual Air Fiesta airshow at the Brownsville South Padre Island International Airport. BROWNSVILLE — The days of Air Fiesta here are over, though there’s a chance it could continue in Cameron County. The Commemorative Air Force Rio Grande Valley Wing, which has been based at Brownsville South Padre Island International Airport and staged the air show for the past 26 years, is looking for a new home after being notified that the city will no longer provide free hangar space, maintenance and utilities. The RGV Wing, established when the CAF moved its headquarters and large fleet of World War II aircraft to Midland during the early 1990s, also maintains a museum at the Brownsville airport that includes several vintage airplanes and memorabilia. CAF had been planning for years to move its operation — and build a new transportation museum and hangar — from its current location south of the airport terminal to one off Boca Chica Boulevard, where it would have greater visibility. Earlier this year, the Brownsville Community Improvement Corporation awarded the CAF a $75,000 grant toward the project. However, in a Sept. 15 email to RGV Wing officials Chris and David Hughston, Airport Director Bryant Walker noted that the BCIC grant offer wasn’t executed by the city because the CAF doesn’t have a lease with the city as required by the rules.